Well, it could have been a lot worse I guess. The Democrats won back the House of Representatives for the first time since Barack Obama’s first term. Republicans gained three seats in the Senate. And President Trump will have an emboldened group of House Democrats ready to foil his gains and put pressure on him with subpoena power. The GOP was destroyed in the suburbs, accounting for approximately two-thirds of the Republicans’ losses. This could prove a long term issue if current trends continue. There was no Blue Wave. There was a notable shift to the left with the Democrats recapturing the House, but it fell well short of the midterm results in 2014, a small wave for Republicans and 2006, a small wave to the Democrats. Demographics and geography doomed the GOP. Many of the swing districts that moved to the left were suburban areas that included urban areas as well. Therefore, when there was a suburban swing, Republican voters were spread too thin to carry the district. The divide has widened as Americans continue to live in states they are more comfortable in politically. Republicans do well in red states and Democrats dominate in blue states. We are becoming more partisan by the day and more tribal by the hour. It’s not all about the economy, stupid. With a decently humming economy, Republicans should have been well situated to keep both houses of Congress. However, what really gets people to the polls is sadly fear or anger. Democrats were riled up and angry about Trump being in the White House and Republicans taking their healthcare while Trump failed to rile up enough of his base over fears of the caravan moving north to our southern border. I have to hand it to the Democrats for running a fine array of candidates, including a number of veterans and women. With Pelosi and a Democratic-run House to run against for the next two years, Trump will likely be reelected in 2020. Unless, of course, the recession finally comes over the next 24 months. Now, let’s get back to the bigger picture. We are cracking up along partisan lines, but are we really as divided as the mainstream media portrays the country? The media has a huge part to play in how heated things are in the country these days. They no longer report on the news factually and accurately. They have thrown objectivity out the window in an all out effort to thwart the success of a duly elected president. They continue to pit ourselves against each other, forgetting that we are all Americans and are all on the same team at the end of the day. Even before Trump was elected, the mainstream media was attacking the America First candidate. They viewed him as a direct threat because he promised to drain the swamp and bring real change to Washington DC. While Trump has failed to do much draining in the first two years, he is certainly changing things up from what we’ve had in recent decades. Since elected, the mainstream media has gone out of their way to paint the president as a racist, sexist, puppet of Putin. While the president rubs people the wrong way on a daily basis, this focus on the things he says and distortion of reality by the media takes away from the many accomplishments his administration has racked up over the last two years. This has created a wave of hatred on both sides of the aisle the likes of which we have not seen for some time. 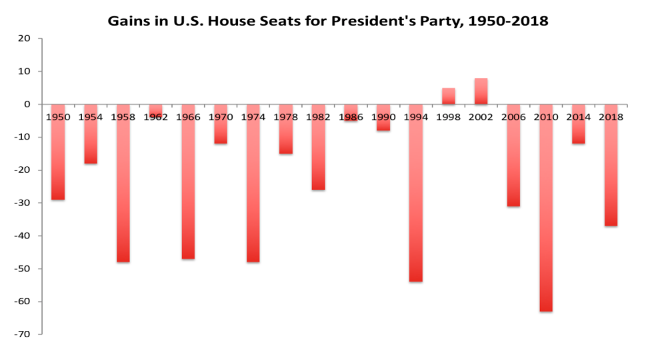 Even with the hatred of the president propelling Democrats back into relevance in Washington, the number of House seats flipped was below the last similar midterm election when Democrats lost 36 seats after Obama’s first term in office and the passage of Obamacare. Democrats pushed hard in Texas but failed to defeat Ted Cruz with Beto O’Rourke. Similarly, the Democrats did all they could to win the pivotal swing state of Florida’s governorship, but came up short with Andrew Gillum losing to Ron DeSantis. Both of these men, along with the liberal rock star Alexandria Ocasio-Cortez in the Bronx, are quite socialist and nakedly in support of open borders and shutting down Immigration and Customs Enforcement. This reckless immigration policy is something the American people do not want and that is the main reason Democrats suffered losses in Texas and Florida. Americans are still moderate. Americans want legal immigration. They do not want the continuance of the status quo. That is why Donald Trump was elected two years ago. The Democrats cannot go full on Democratic Socialist and win big elections. The country is not there yet. So, it appears less likely they will go with a Bernie Sanders / Elizabeth Warren type Democratic Socialist against Trump in two years. But who knows who they’ll trot out. There is no doubt that this election was largely about Trump. This was not a rebuke of his presidency. This was the people making their voice heard and voting their conscience. The turnout numbers were significant and Democrats, especially young voters, stepped up and made a difference in the balance of power. Trump’s rhetoric has likely turned off a number of suburban households which resulted in the GOP losing control of the House. But for all of Trump’s faults, I believe Americans are much more afraid of the radicals like Gillum, Maxine Waters, and Ocasio-Cortez than they are of America First Republicans that want to secure the border and bring prosperity to all Americans through lower taxes and pro-business policies. Though Trump will certainly face more challenges over the next two years with Democrats in charge of the House again, there is no doubt that Trump is still in charge and holds all the cards. Whether he plays those cards right is another discussion worth having in another article. When Newt Gingrich stole the spotlight from Bill Clinton during the Republican Revolution in the 1990s, he attempted to run the country from the House. This was ultimately unsuccessful and unsustainable. Today, however, Trump might have lost the House, but he still owns the spotlight and remains the center of attention. He still has the most power in Washington and has his hands on the steering wheel as he struggles to continue the country’s rightward shift. Trump was his usual Trumpian self on Wednesday when he took questions for 90 minutes. He loves these verbal battles with reporters who despise him. Especially the peacock Jim Acosta, who has had his press credentials revoked because of his latest show for attention. Trump did not see Tuesday’s results as a thumpin’ like George W. in 2006 did or a shellacking as Obama called the 2010 midterms. The Donald, a master of today’s media, turned around the midterms to his favor, calling it a victory and blaming Republicans who did not win for not embracing him and his policies enough. He even called some out by name! The president is right to boast about what happened, despite the media’s claims of this election being a referendum on Trump. As I’ve stated, the losses in the House could have and maybe should have been much worse. The Democrats have a slight majority in the House and many projections had them winning much more than they did. But the polls and predictions have little merit these days and I no longer put much stock in them. Trump’s base still came out for him and in key states where he rallied voters, candidates did well and won. The GOP’s sustained strength in key battleground states like Florida, Ohio, and Iowa strongly suggest that Trump’s path to reelection in two years is still wide open, barring an economic disaster. What direction will House Democrats go over the next two years? Will they attempt to impeach the president without any chance in hell of that happening with the GOP’s firm hold of the Senate? Will they try to investigate him and ensure that Mueller’s investigation is not handicapped now that Sessions is out the door? Or will they work with the president to keep his economic agenda moving forward and perhaps get something done on infrastructure? Like it or not, my friends, the 2020 presidential election has now begun. Place your bets now! Trump hit a small bump in the road toward MAGA-land this week, but he still has a tank full of gas and a car in fine condition though with some scrapes from a fender bender or two. Let’s see how many detours he takes over the next two years.